Was David Duchovny's Family From Ukraine or Russia? There's been quite a fuss about a nationalistic, Russian beer commercial David Duchovny made not long ago -- especially given that he recently discovered that his roots are actually in Ukraine. For obvious reasons, this is less than ideal timing. As a genealogist who also has Ukrainian roots, but grew up being told she was Russian (Smolenyak -- we must be from Smolensk, of course! ), I decided to take a look into the specifics of Duchovny's case. It doesn't take much effort to learn that his grandfather was Moshe Duchovny, but that's where things start to get challenging. 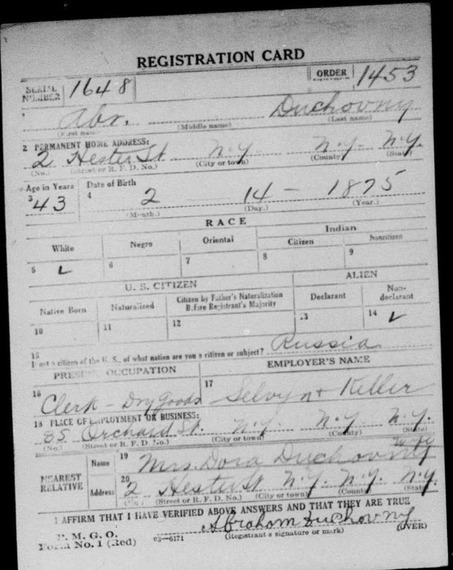 If you search Ellis Island records for likely candidates, a couple with similar names pop up, but their ages and years of arrival don't match what's known about David's grandfather. That's because the real Moshe Duchovny is well hidden since his name was badly distorted on his passenger arrival record, possibly because he and his father Abraham embarked in Greece where names like theirs would have been unfamiliar (in spite of the popular myth that names were deliberately altered at Ellis Island, officials there mostly verified lists created at the point of departure). In case you're curious, here's the declaration of intention for Abraham Duchovny, filed by David's great-grandfather in December 1920. In it, it claims to have been born in "Kiev, Russia." That alone is enough to confuse us today, but avid researchers also know to be wary when immigrants cite a major city as their place of origin because they often used the closest one as a proxy for the town or shtetl they really came from, assuming (no doubt, correctly) that no one here would have heard of it. Note also that he lived at 2 Hester St. and his wife Dobe was back in "Russia." 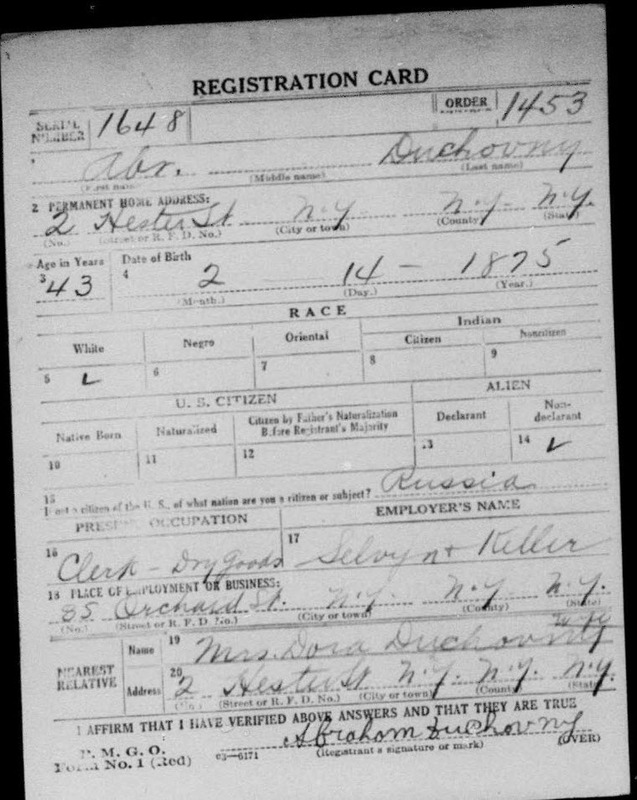 In his WWI draft registration card recorded in September 1918, Abraham was still living at 2 Hester St. and his wife -- who was now going by Dora -- had apparently joined him. And once again, he stated that he was a citizen of Russia. Incidentally, he was working at 85 Orchard St., just about a half a block from the Tenement Museum located at 97 Orchard. 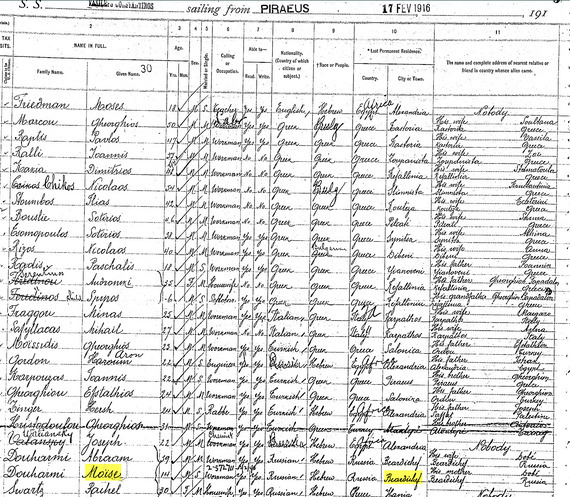 Using additional details provided in his declaration of intent -- specifically, that he arrived on the Constantine from Piraeus, Greece on March 7, 1916 -- it's possible to back into his passenger arrival record despite the distortion of his name. 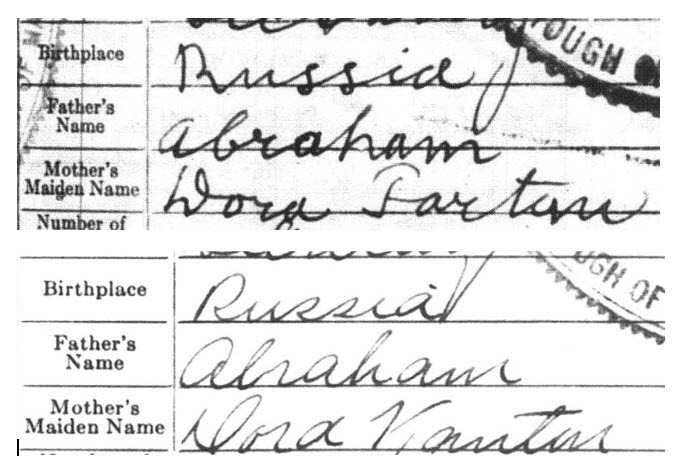 He and his son, Moise, are both listed as "Douharmi," but this is definitely the same Duchovny fellow in the declaration, and if you read the rest of the details, you'll learn that his wife, Dobe, was back at home in "Beardichef, Russia" -- what's now known as Berdychiv, Ukraine. 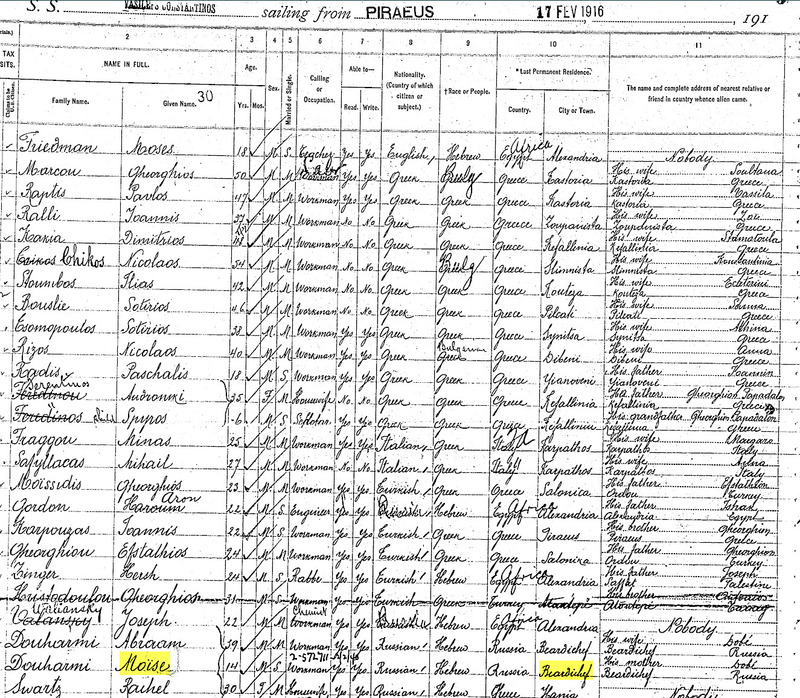 Lest there be any lingering doubt that this is the correct fellow, David's grandparents married twice (immigrants sometimes did this, usually starting with a civil ceremony and following with a religious one), and in both instances, Moshe's parents were noted as Abraham and Dora, just as expected. His birth place on both records? "Russia." The bottom line is that David's Duchovny grandfather and great-grandparents were originally from Berdychiv, which by today's borders, is clearly in Ukraine, but Ukraine as an independent country was a distant dream when the family left in 1916. 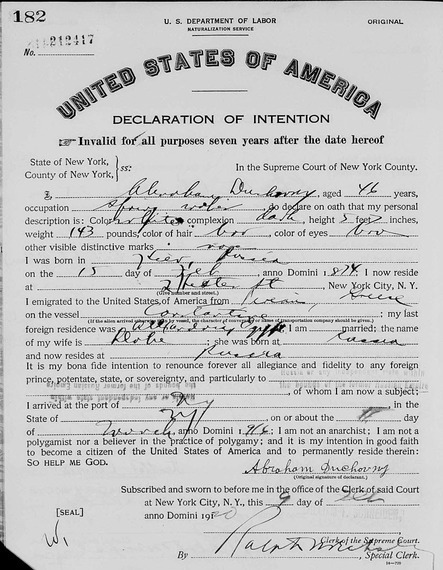 The immigrants themselves repeatedly identified themselves as Russian, and upon applying for American citizenship, Abraham renounced his allegiance to "Russia, or any independent state within the bounds of the former Russian Empire." So it's easy to see why David would have been raised with the impression that he was of Russian heritage, and short of a deep dive into his ancestry, it would have been difficult for him to learn otherwise. Admittedly the commercial could have been better timed, but you can't fault the timing of his immigrant ancestors whose 1916 departure was just shy of the 1917 Russian Revolution, a 1919 pogram in Berdychiv, and widespread destruction of the city by Soviet troops in 1920.